When I bought my first DSLR back in 2010, I didn't know much about composition, basic camera settings or any post processing techniques. I was happy taking random photos and thought if I could somehow produce the pictures with shallow depth of field (making background blurry and foreground in focus), I would master the photography. As I started taking more and more pictures, I wanted to share it with more people and get some feedback. I then joined one of the leading photography community forum of that time and posted few pictures. I was expecting to get some nice comments about my photographs which I did get few but also got lots of critics and what could I do more to make it look better. They were gracious enough to take their time and pointed out my mistakes and suggest me for the improvements. That's when I realized I know nothing or very little about photography. I didn't take any pictures for few weeks and started to explore my options to learn more about photography. I started reading about composition, basic camera control and settings and apply them into practice. I slowly started understanding the basic concepts of photography and various composition techniques. As I started learning more and more, I realized the mistakes I had done in the past and tried to be aware of it in my next shoot. Sometimes, I used to manage to take well composed photographs, but lighting would go off. Sometimes, I would get well balanced picture but unwanted objects inside the frame would create a distraction. It is not always possible to re-shoot and produce the result as you wanted; you can't re-shoot the sunset after sun goes down, for example. Sometimes, distraction is a part of the frame when you compose it and there is no way to remove it during the shooting. That's when I started realizing the importance of post processing in photography. Well, post processing has always been an important part of photography even in film era but it has been completely revolutionized with the introduction of computer and software. It might be very confusing to choose one particular software out of many available in the market. But, in my case, since I was shooting with Nikon DSLR and it also offered a professional photo editing software, I went with their editing tool, Capture NX2. Ever since I started shooting RAW and editing with Capture NX2, I realized that modern digital photography is incomplete without these post processing tools. Camera cannot always predict the right color-tone or temperature of the subject and that's when you need a software to balance it during editing. Even though most of the times I use software only to balance the color tones, straightening the pictures and crop it, I also use it occasionally to remove the unwanted objects in the photograph to minimize the distraction. Let's discuss more about the importance of post processing with this example below. This picture was taken at the Martin Luther King Jr. memorial in Washington DC. 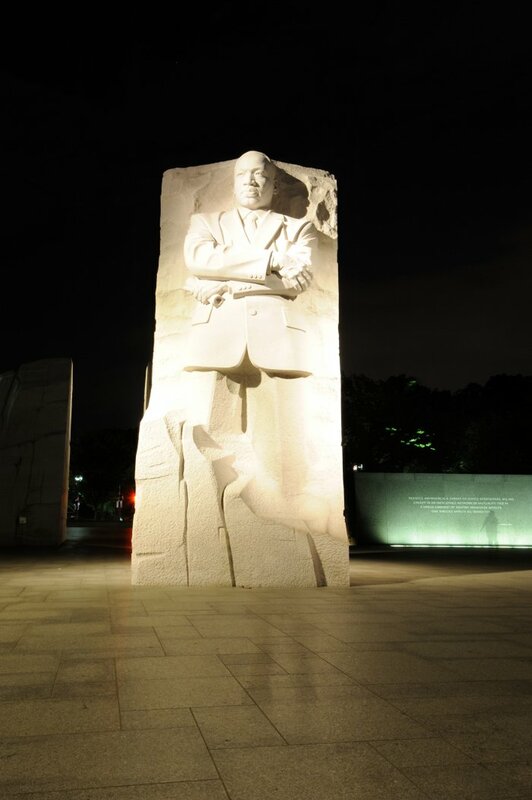 It was shot at night around 2 AM and there were some external lighting sources to illuminate the statue of MLK. Obviously, I had no control over those lights and wouldn't be able to manipulate them. All I could do is shoot with an angle that gives me the best possible result. So, I went little farther from the statue so that I could extend the focal length and minimize the lens distortion. While I was waiting for the crowd to clear the area (yes, there were quite a few people even at 2 AM in the morning), I adjusted the camera settings and took the shot in a long exposure mode. I took few more shots with different angle and camera settings and left for home. Next day, when I reviewed the photographs on my computer, I found many problems with it. Some of them I could possibly avoid during the shooting and some of them I wouldn't be able to. Lets analyze what I think went wrong in the original picture. First, his face is the most important part of the frame and yet there are other areas that are as bright or even brighter which creates distraction. And I think because of the combination of long exposure and the external light source, lots of other physical distractions are also visible. I wanted to make the statue stand out in the frame and engage the viewers without having them wandered around all over the frame. And since his face should be the center of focus, I wanted to make other parts less bright and less visible as well. However, I wanted to leave the shadows untouched because it plays an important role to reveal the form of statue. I also wanted to keep the lights in the background to let the viewers know that this is not a black and white photograph. Now you have seen the picture before processing it and after. Do you agree that post-processing enhanced the picture or I carried it to the excess? Do you think the final image does justice to the sentiment of the photograph or post processing killed it in someway? Please let me know what do you think about it in the comment section. Is Post Processing Necessary In Digital Photography? Afrina (Kuala Lumpur, Malaysia) asked : I am not a pro photographer but I enjoy photography. When I visit the flickr and other photographers' website or blog, they have a collection of amazing photographs. Some of the photographers also revel what editing tool they used and what was done on the picture during post-processing. Do you think it is necessary to use any software to make your photograph look good? I have seen this confusion on many photographers from different level of expertise. I think this wouldn’t be that much of interesting topic when you are just starting photography but as you progress more on your composition skill and master your camera settings, the next stop would be the editing skill. I also went through the same situation a while ago and started looking my option for post-processing. When it comes to the editing, different photographers have different views about the process and the tools they would like to use. Even after reading many blogs and online tips, the answer was not so clear to me whether the editing skill is a must to have to enhance your photography or it is just an optional choice. Some of my friends jokingly say that, if you are using Photoshop to enhance your photographs then it's not a photography, it is a Photoshopgraphy. I find it funny but meaningful statement at the same time. When I see other photographers’ work, I forget all the critics and feel like editing is a must have skill set and is one of the important part of digital photography. After doing much research, I wrote a blog about post processing where I discussed more about the post-processing and listed down some of the best known post-processing software in the market. To be honest, it is not always necessary to use a software and process the pictures but sometimes you find it necessary just to tweak some settings, adjust colors and lights or even crop the sides. Some people think cropping is not really a post processing but I would say, if you use any software to manipulate the photographs by any means, it is a post-processing because you processed the photographs after taking it out from the camera. Let me present you an example of a photograph, before and after processing it, and you shall decide if post-processing is really necessary or not. And also, as always, I welcome your comments as well. I took this photograph of the Lincoln Memorial Reflecting Pool last year. When I came home and downloaded the picture from the camera, I felt good about it's composition (symmetry) but felt like I was missing something on the picture. I was not really happy with the color contrast and thought of playing with the color tones and the contrast and see how will it become. I started editing the picture using Capture NX2, one of my favorite software to process RAW images. During the processing of the image, I increased the color contrast and adjusted the brightness of the picture which transformed the picture into the next level. Just a couple of small tweaks boosted the mood of the image and the result was very impressive. The picture looked more vibrant and lively after the post-processing. The result is in front of you and I let you decide whether the post processing is really necessary in digital photography or not. But looking at the transformation this image got, I think you would agree that post-processing is an essential tool and may greatly help you to enhance the picture if done correctly. You just have to be careful about not doing it too much, otherwise it may not look natural.